Morphy Richards 501014 Features: 1.6l capacity - Juice and smoothie options - Top down motor - 4 texture settings Mid range VIEW PRICE HERE! 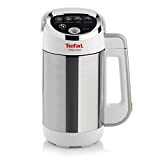 Tefal Easy Audible alert - Keep warm function - 1.2l capacity - 4 functions - Recipe book Mid range VIEW PRICE HERE! VonShef 800w 1.6l capacity - Ice crusher - Safety features - Extended 2 year warranty Affordable VIEW PRICE HERE! We live in confusing times. The internet has granted us unprecedented access to a wealth of information, opinion and advice concerned with becoming the best you you can be. We are bombarded with messages about how to prioritise good health through increasingly convoluted means: embracing superfoods, taking supplements, going back to caveman basics, drinking your meals, cutting out carbs or eating everything raw. It is lovely to have so much knowledge at our fingertips, unfortunately much of it is a contradictory tug of war between trend and tradition, leaving us more confused than ever. Here’s what we do know: eating good food makes you feel good. By using fresh, healthy, ingredients and preparing them simply you can make the good food you enjoy while preserving the health giving properties. And there is no more comforting way to eat simply and healthily than soup! Forget the new superfoods, soup one of the world’s most enduring food superstars. And it is enjoying a huge resurgence in popularity thanks to new technologies and a growing movement towards one bowl eating. We are all growing more conscious of the issue of food wastage – for budgetary reasons on a personal level and of the broader national problem – soup is the perfect, nutritious, way to utilise leftovers and make a limited budget stretch. While it may seem like a gadget too far, a soup maker can become an excellent and timesaving addition to your kitchen. Because, despite our best intentions, it sometimes feels like a huge faff to painstakingly slice, saute, and supervise the components that will eventually become a saucepan of warming soup. Not to mention the clean up operation after. Psychologically (as well as logically) there is something pleasing in the act of chopping veg into rough chunks, tossing them into a magic pot, closing the lid and returning to piping hot soup within half an hour. Soup makers are, essentially, faff reducing devices. A compact and convenient home solution to save you time and effort with almost the same rinse and go clean up effort you might exert after buying and heating a carton of ‘fresh’ soup from your local supermarket. With many machines sauteing, in addition to cooking, ingredients and texture settings to suit every taste, the acquisition of a soup maker frees you up to ponder new flavour combinations while it does the hard work for you. Or simply curl up with a cuppa and wait for the ping! A name you can trust meets a soup maker you can rely upon! 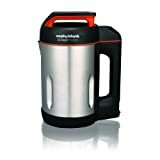 Beneath the attractive brushed steel jug of the Morphy Richards 501014 Saute and Soup Maker (VIEW PRICE HERE!) is a rather marvellous machine, which will saute, simmer and blend a soup that perfectly suits your palette while you do little more than throw in the components and twiddle your thumbs. A well considered series of options make this a nice multipurpose choice delivering soups in a range of textures from hearty to smooth as silk and juices and smoothies to boot. If you have a kitchen with limited storage or counter space and have been weighing up the benefits of smoothie making this would be a very good maker to opt for. The rinse and wipe clean up offers another huge selling point at the end of a busy day. This is a quick and efficient machine which enables you to extract maximum nutrition and taste advantage from your ingredients. With its precise timing to safeguard against mush and pause function allowing users to add seasoning and spice, or simply to taste test and anticipate the meal to come. A recipe booklet helps get things started but with a machine this simple to use, you’ll be improvising delicious soup before you know it. Users can easily play with a variety of texture and flavour combinations in Tefal’s Easy Soup soup maker. Combining simple operation with a clear display, 4 texture options and a manual mode to keep your soup bespoke. Baby food, batters and smoothies are also a doddle thanks to a blend programme without heat. Family life would also benefit from the 40 minute warming function which automatically kicks in if you are ever distracted away from the triple beep completion alert. Lacking the saute function of its competitor, the Tefal Easy Soup is nevertheless a strong contender in terms of time saving. Cutting out the need to stand over a pan with spoon in hand and producing smooth, delicious soups every time. However, at this price point it is a pity that one is unable to pause and season mid process and that oversight may be off putting for those who like their meals a little more flavoursome. That being said, the inclusion of a cold blend programme does allow one the option of all those future smoothies, compotes and batters to compensate! You may quickly recreate your favourite soups and smoothies in the sleek and simple to use VonShef soup maker. The thoughtful safety features – an overflow alert and an anti dry function – make this another strong choice for families 9or the absent minded) and further enhance the ease of use. With its 1.6 litre capacity, this has the same generous jug as our first soup maker but at a lower price point. Smart, restrained, design make it the aesthetic winner too. 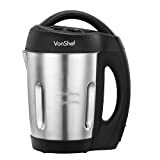 The VonShef soup maker is a sturdy and attractive machine with consistent enough performance to reassure users that they haven’t chosen style over function. That ice crusher extends those functions ensuring it would make a handy and versatile choice for your home cooking needs. With three solid and well respected contenders to consider the final verdict wasn’t easy. But for a truly great soup you need true depth of flavour. This takes the ability to stop and season and, more often than not, the kind of base notes that can only be achieved by saute. It would seem a pity to have access to the speed and ease of a soup maker yet to still find yourself scrubbing down a frying pan once the final spoonful has been enjoyed. The Morphy Richards 501014 Saute and Soup Maker wins by virtue of that essential saute function and the flavour-friendly pause option. 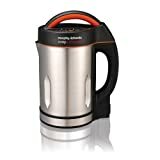 Its 1.6 litre jug size also impressed us and allows the potential to gain back the step up in price with the money you could potentially save by forgoing expensive lunches or insipid supermarket sandwiches and taking soup to work instead!